In the first phase (best views) of the prestigious Hameau des Crosets development our modern luxury apartment, which was completed in April 2007, looks directly onto the Dents du Midi with amazing floor to ceiling panoramic views of the mountains and the main slope. Ski in Ski out with immediate access to 650km of Piste on the Portes du Soleil in Switzerland and France. Restaurants, a mini supermarket and ski hire facilities are all on the doorstep. The spacious apartment is furnished to a very high standard with three double bedrooms, two luxury bathrooms, a luxury fitted kitchen with dishwasher, induction hob, oven and microwave, Nespresso coffee machine, open plan to a large lounge/dining room with fireplace (internal living area of 110 sq meters). There is a very large balcony which runs three sides of the property (external area of 65 sq meters) with spectacular views over the Dents du Midi and main ski slope. The 42' Plasma TV has digital access to UK TV Channels and 7 day catch up and a DVD player along with free high speed WIFI internet access. Secure underground parking for two cars, a ski room for all your ski equipment and a lift directly to your front door is provided. This luxury apartment is situated in the heart of the beautiful Swiss alpine village of Les Crosets with access to 650km of skiing in the Portes du Soleil, the largest ski domain in Europe. Les Crosets is just as beautiful in the summer months as is it is in the winter. It is the perfect getaway for those who love walking, lift hopping or mountain biking. During the summer months the local Tourist Office offer the Multi Pass Portes du Soleil. The Multi Pass Portes du Soleil is the perfect way to enjoy unlimited access to a massive choice of activities and facilities in all 14 village-resorts. The minute we found Les Crosets we fell in love with it. Les Crosets is your quintessential traditional Swiss Alpine village and will not disappoint any visitor. We bought the apartment off plan in 2007 because it was by far the highest specification of any ski property we had seen in our extensive search of France and Switzerland. The view from the living room is breathtaking and unrivaled in the Hameau. The apartment has 65 square meters of balcony spanning three sides of the property. It attracts the sun throughout the day including evening sun on the front balcony. The view of the Dents du Midi is spectacular - the colours on the mountains when the sun sets are a site to behold. The apartment is very spacious with three generous double bedrooms and two bathrooms. Because it is new build it is very warm with underfloor heating throughout and well insulated. The large bathroom has two sinks, a hand held shower attachment and a fixed shower head. There is an extra long bath (1.8m) perfect for a soak after a long day on the Pistes. The shower room is a wet room with body jets and a large fixed shower head. A lift takes you from the underfloor parking area to the front door of the apartment. There are 2 parking spaces. A Bluetooth Speaker is provided in the Living Area. Large and bright apartment comes with everything you would need. very nice Apartment, super furnished with all amenities. Good location, close to the ski area an the lifts. 5/5 stars for this fantastic apartment / location. We had a fantastic week in Les Crosets, it's a quiet village with a few bars / restaurants (who needs crowds!) and as a gateway to the Porte du Soleil it's probably one of the best, with minimal lift queues even in February peak week. The stylish apartment provided everything our party of 6 required with stunning views to the slopes and mountains beyond. The day after we returned, we booked again and can't wait to return next year, which I think demonstrates the attraction of this hidden gem. We are delighted you enjoyed your holiday in Les Crosets so much. It really is a 'hidden gem'. A beautiful apartment in an amazing setting. Warm, attractively decorated and superbly equipped. The view from the living room window is sublime. The skiing is great for all abilities and walking up to the Relais for delicious rosti and cidre chaud a real treat. A winter wonderland for sure, wherever you look another beautiful view. It really is a place which has something for everyone. We have had an amazing week and hope to return soon. We are delighted you had such a good holiday in our apartment and enjoyed everything about the local area. We really hope to welcome you back soon. Wonderful apartment - great location and views. We have been in four apartments in Les Crosets, and this by far is the best! We had a marvellous time in this wonderful apartment. It had everything you need for a perfect time. We were a family of 5; 2 adults and 3 teenagers, the eldest 19. There was ample room for us all; even to snuggle up and watch a film. Location couldn't be better, as we were able to ski out, and only a short walk back after a day on the slopes. Spotlessly clean, and Gill was really helpful - thank you. We'd love to stay again. We are delighted you loved the apartment and of course the ski domain. Les Crosets is a hidden treasure. We will look forward to your return next season. Les Crosets is a quaint Swiss village situated at 1700m (the highest Swiss village on the Portes du Soleil) providing excellent access into the Portes du Soleil ski area up to an altitude of 2300 metres. The Portes du Soleil is one of the largest linked ski areas in the world, comprising of 14 villages (6 Swiss, 8 French) with access to over 650km of pistes. 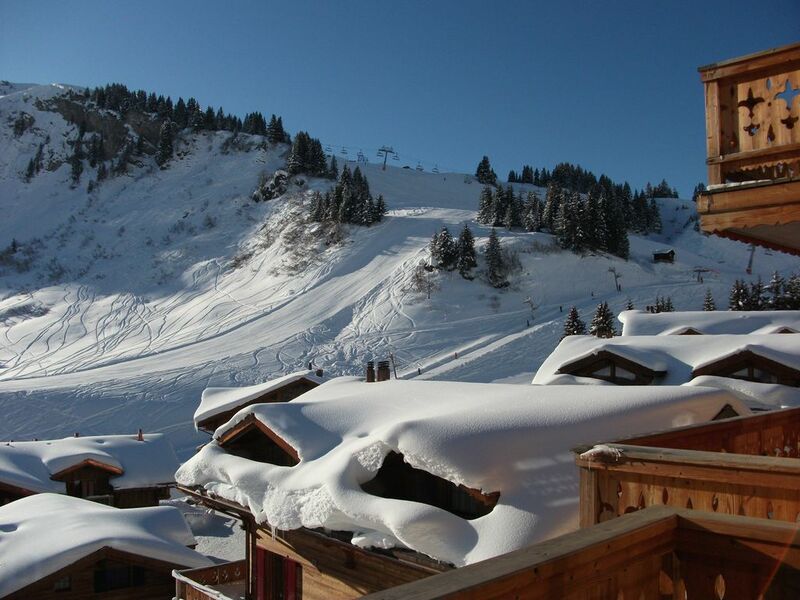 The linked villages include Avoriaz, Morzine, Les Gets, Chatel, Morgins and Champery. Throughout these villages you will find an abundance of traditional and atmospheric bars and restaurants to enjoy a coffee or lunch. The Swiss 'Wall' is only 2 lifts away and the area caters for all ranges of abilities. There is a Snow Park in Les Crosets and nearby Avoriaz. Les Crosets is an easy 1.5 hour drive from Geneva and has good local transport links. There are plenty of facilities on the doorstep; a ski school, ski hire shops, supermarket and restaurants all within easy walking distance. In the summer there is an extensive network of walking and mountain biking trails. The area is renowned for holding the Mountain Biking World Championships. The enchanting village of Champery is only a 15 minute drive away. There are a wide variety of summer tourist attractions nearby including Le Bouveret Aqua Parc, and the Thermal Baths at Val d'Illiez and Lavey les Bains. Lake Geneva is 30 mins by car where you can windsurf, jet ski, sail and waterski as well as visit the famous lakeside town of Montreux. Rental includes all bed linen and towels. Clean at end of rental. SEASONAL RENTALS CONSIDERED. Please contact us to discuss your requirements.